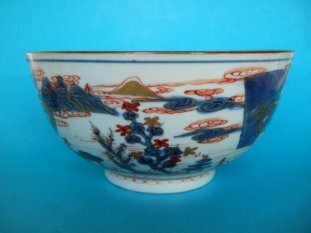 A nice Chinese Imari palette bowl from the second quarter of the 18th.Century. Decorated with a painted and stylised landscape scene. The inside of the rim decorated with a floral border. The interior base painted with flowers and foliage issuing from rockwork. Measures 23cm. (9 inches) diameter. There is a re-stuck chip to the outside of the rim and a couple of hairline cracks. Still rings well when tapped. 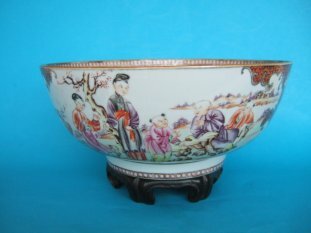 A very well decorated Chinese export porcelain bowl from the third quarter of the 18th.Century. Painted with figures in a garden landscape setting. The scenes contained within scroll edged reserves of 'Y' diaper patterns. The inner rim and the foot decorated with 'cash' patterns. Measures 26.2cm. (10.25 inches) diameter.. It has no marks. The bowl has two tight hairline cracks and a small re-stuck chip to the inside of the rim which issues a short 1.5cm hairline. The enamels and gilding are in very good condition. The bowl still rings well when tapped and displays beautifully. A Chinese Kangxi Period Charger. 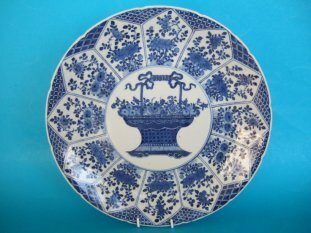 A Chinese Kangxi period (1662-1722) blue and white dish measuring 31.5cm. (12.45 inches) diameter. The rim has twelve indents and is decorated at the edge with various diaper patterns. There are twelve petal shaped panels filled with various flowering plants radiating from a circular central reserve painted with a ribbon tied basket of flowers. The back of the rim painted with three floral sprigs. Marked in the centre with a leaf symbol within a double circle. A very faint and tight 5.5cm. hairline at the rim. Typical slight fritting to the rim. A Chinese Export Spoon Tray. 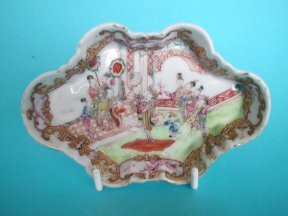 A charming Chinese porcelain Spoon tray. Extremely finely painted in 'Mandarin' style with a scene of musicians, children and attendants 'performing' for a seated dignitary, maybe the Empress? Dates probably from the second quarter of the 18th.Century. Measures 12.7cm by 8.7cm. No marks. Unfortunately it has old damage. A stapled repair to the rim has now had the staples removed and re-stuck with modern ceramic glue. No overpainting.